Being from Detroit, I'm partial to the Motown sound. You know it when you hear it, every time. Ever wonder why? 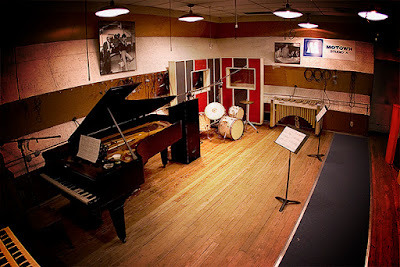 The story goes that, after lots of experimenting to find the perfect sound, the studio engineers at Motown Records nailed everything to the floor -- drum kit, amplifiers, microphone stands -- so they could keep repeating their winning formula. If it worked for Motown, why not borrow the idea -- and "nail down" marketing success for your business? ... and every other word you say or write. Has any of it ever worked? Have you ever produced a sale? Now, how many of those winning formulas have you nailed down and turned into email templates, phone scripts, and proposal templates? If your answer is "None," why not pick one area that's working and nail it down, so you can repeat your successes? How would you like to know -- at a glance -- whether your agenda for the day is setting you up for success, productivity, and profits? Well, you can. It's dead simple, really. All you need to do is color-code agenda items 2 ways: low-profit activities and high-profit activities. In my case, those colors are red and green, respectively. Based on my 80/20 Marketing principles, which hold that the fastest way to success is to do more of what makes you money in the time you now waste doing what doesn't, I try to fill every day with high-profit GREEN activities. That way, I can see -- instantly -- if I'm on track for a profitable day. 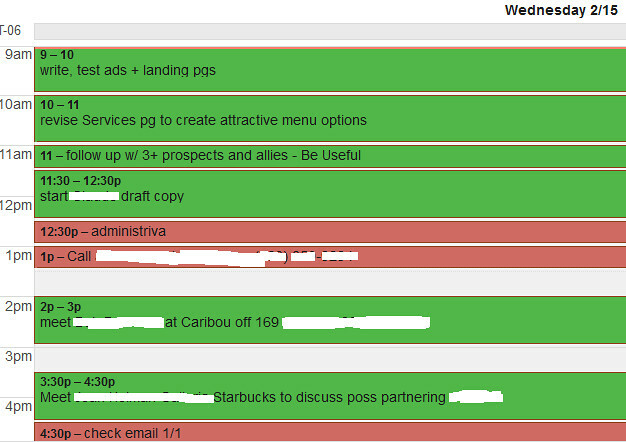 Names and details have been blocked out to protect the innocent, but you can quickly see what a profitable day looks like -- the more green activity, the better. You might want to give this idea a try tomorrow, and color-code your agenda two ways. Let me know what you choose as your color of money in the comments section below. The Money-Back Guarantee: Kill or Cure? 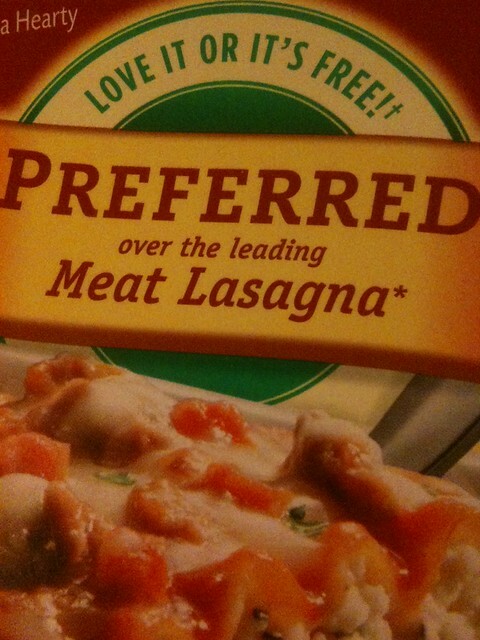 Guess which 5 words on that box of lasagna caused my wife to buy it? Right. The guarantee: Love It Or It's Free! But we never would have found out if the maker hadn't removed the risk of trying this new product by guaranteeing we would love it, or not have to pay. 1) A strong guarantee can work like gasoline, if your business sells crap and/or treats clients poorly. The more people who buy and tell their friends about your crappy business, the faster it burns to the ground. 2) A guarantee can work like steroids, if your business sells cool stuff and/or treats clients like royalty. The more people who buy and tell their friends about your remarkable business, the faster it grows. Bottom line: If you're any good at what you do, a strong guarantee can accelerate your sales ... and you can enjoy bucket-loads of new profits. If you're not, it won't ... and you can't. What Do You Really Know About Your Marketing? One of the most-important things you can do is to regularly separate what you really know from what you think you know about your marketing efforts. So, here's a question: What's working in your marketing? Another question: How do you know? Fact: If you can't answer "What's working in your marketing?" with cold, hard numbers straight from QuickBooks, you really don't know anything. You are guessing. Playing blind archery. A danger to yourself and your business. Let's assume I have sufficiently guilted you into analyzing your numbers and finding out exactly which marketing activities are producing which revenue. Example: You got 17 clients and $74,600 last year from client referrals ... 13 clients and $57,000 from networking ... 5 clients and $31,200 from public speaking ... 3 clients and $23,000 from articles you wrote ... etc. When you run the numbers, you will find, in all likelihood, that approximately 20% of your marketing produced about 80% of revenue. I have written before about this 80/20 Marketing phenomenon, so I won't do so again here. In a nutshell, the 20% of your marketing efforts have HUGE upside potential. If you doubled these "20% Areas," you could expect to get 160% of current revenue. And the other 80% of your marketing? They are dragging you down. Your task as an entrepreneur (business owner, marketing manager, whatever) is to shift resources from 80% Areas of lower productivity into 20% Areas of higher productivity. To illustrate, here's an example of low-value 80% Areas from one of my 80/20 Marketing students, along with his opportunities for becoming more productive -- and profitable. What parallels can you see between his business and yours? His least-profitable clients are first-time home buyers. They require more education, showing of homes, hand holding through the mortgage process … for much less payout than experienced buyers. His least-profitable marketing methods are sponsoring community events. They pay for a booth, have to set up everything, stand around all day, and don’t get any leads. But they do get "visibility." Clients: He can focus on targeting experienced “move-up” buyers and delegate as much of his dealings with new buyers as possible to his people/agents. Clients: Turn new buyers into experienced buyers ASAP. Develop a “New Client Welcome Kit” that answers all typical questions and automates their education, so he can focus on high-value activities. A 15-minute educational video on YouTube could save him 3-4 hours of lost time per week (and get search engine traffic, social media mentions, and new leads to his site as a bonus). Marketing methods: Taking the “New Client Welcome Kit” to its logical end, he could develop a series of articles or videos to answer the same questions he’s heard for years, then offer them to local newspapers as free articles. At the very least, have a college intern turn his knowledge into blog postings. No need to write – he can dictate much of the content off the top of his head via Dragon or other dictation software. Marketing methods: Do fewer community “visibility” events and reinvest that money in efforts to surprise and delight existing clients (and stimulate referrals). Example: stage a nice event for clients and their guests; the theme can be seasonal, especially during his slow winter season. This is the perfect illustration of 80/20 Substitution: moving time/money from low-value areas to high-value areas! You get the idea. In any business -- including yours -- there are screaming opportunities to boost sales and profits, by doing more of what makes you money in the time you waste doing what doesn’t. That idea is at the heart of 80/20 Marketing. There's a lot of confusion about strategy and tactics. You've heard that strategy is your objective, and tactics are how you'll achieve it. Or that strategy is the plan of action, and tactics are the weapons. And, yet, you still mix them up. I know I do. Think of strategy as a recipe for success, and tactics as ingredients. Doing so can bring instant clarity. Example: If your recipe for success (strategy) is to increase your business by 50% through referrals, it becomes very clear which ingredients (tactics) to use. Ingredients that are clearly wrong, like automated webinars, print ads, or Groupon, won't distract you. Using them for this recipe would be like using sardines to make a chocolate cake. It's not a perfect analogy, but it works for me. And thinking about strategy and tactics in new ways can generate new insights to grow your business. Bottom line: When your strategy is clear, the tactics reveal themselves. As a copywriter, it's my job to describe my clients' products or services in clear language that compels people to buy. Want to learn one of my tricks to writing ads that sell? You can use it to improve your own sales letters, web page copy, email promotions, postcards, etc. It's this: Let your clients write your next ad. In other words, get and use as many testimonials as possible. When you use testimonials -- written, audio, and/or video -- you are talking to prospects in the actual, unfiltered words of your best clients. This builds rapport and trust with your ideal prospects. Because you're speaking their language. Not techno babble or marketing-speak, but the language of people who have already given you money. 1) Listen for signs that your clients love what you do. 2) Write down what your client said, word for word, as best you can -- right away. 3) Ask if you could use their comments in your marketing materials. "Jeanne, thanks for saying that. I really appreciate it. Would you be willing to let me use your comments, with your name and city, on my web site and other marketing materials? It would mean a lot to me. And it would tell others what to expect when doing business with me." "Jeanne, thanks again for agreeing to let me use your kind words about my business. Below is what I think I heard you say on the phone today. Would you please add to or subtract from it until it says exactly what you want it to say, then send it back to me? Thank you!" "Jim Beckman at Full Throttle Print has been my go-to printer for nearly a year now. He never ceases to amaze me with the service and quality I get from him, at a price that’s comparable to what I used to pay at FedEx Kinko’s. He’s fast, he’s good, he’s dependable, and a great value. As long as Jim is in the printing business, he will get all of my printing business." Here's part of why that short testimonial packs a lot of punch: when I say Jim's printing services are "... at a price that’s comparable to what I used to pay at FedEx Kinko’s," I'm talking directly to Jim's prospects, most of whom have used FedEx Kinko's. Jim, being a professional printer, never uses FedEx Kinko’s. He would have never thought to say that. But for me, a small business owner (and his ideal client) it's a natural thing to say. My comments help Jim build rapport and trust with other small business owners like me -- Jim's ideal clients. Imagine what 5-6 testimonials like that could do for your business? To attract more clients like your best clients with testimonials, just do these three things: listen, write, ask. French economist Jean-Baptiste Say wrote: "The entrepreneur shifts economic resources out of an area of lower and into an area of higher productivity and greater yield." In other words, entrepreneurs create value. They produce bigger, faster, better results from the same effort. As a business owner or high-level manager, you may focus most of your thinking outwards, to create better results for your clients. But don't forget to look inwards, to create better results for your business. Fact: The two most valuable activities in any business are marketing and innovation. That's according to Peter Drucker (and my experience and your experience). Marketing and innovation produce results. All other activities are costs. Now, take a moment to think entrepreneurially about your marketing. Are you shifting resources from areas of lower productivity into areas of higher productivity? What was their first point of contact with your business? What did they buy first? What did you say or do that caused them to buy? When you know what's working in your marketing, here's what you'll find: About 20% of your efforts are bringing in 80% of your revenue. That 20% of your marketing is REALLY producing results. The other 80%? It's a cost. Your task as an entrepreneur (business owner, smart manager, whatever) is to shift resources from areas of lower marketing productivity into areas of higher marketing productivity. Never stop doing this and your marketing will never stop improving (or making you more money). You can learn exactly how to do this in my 80/20 Marketing program, by the way. The exciting quest for new marketing methods can bankrupt you. 1) Chasing the flavor of the month (Facebook ads! LinkedIn ads! Facebook fan pages!) can stretch your time and money to the breaking point. You know this. 2) Chasing new marketing methods can result in costly amnesia. You may not know this. After analyzing my revenue for last month, then comparing it to last year, I realized that, around August 2011, I stopped attending weekly meetings of a local business group that had brought me 3 excellent clients and another half dozen referral partners. Why did I stop doing it? I simply got bored, forgot about it, and moved on to other shiny new marketing tactics. In other words, I had no good reason to drop this proven tactic and chase unproven ones. So, tomorrow morning, I will visit that group again and make enough connections to get at least one new client. And I will do the same next week. Question: Looking back at the last 12 months, what was working in your marketing that you stopped doing, for no good reason? I'll bet you lunch there's at least one profitable business-building tactic that lies forgotten in your calendar, like a mummy buried in sand. Find it. Dig it up. And don't stop doing it until it stops paying you back. Along with the words on your web site, your prices, the message on your voice mail greeting, and other branding elements, every thought in your head must support the business you want to create. All you need is one good idea to make a million bucks. But you can't build a million-dollar business with 50-cent thoughts. Example: Would the head of a $1-million business flit from email, to Twitter, to LinkedIn, back to Twitter, then answer the phone ... and expect to get anything done? Because, not only do you lose time changing gears switching from activity to activity, you lose focus. And focused thinking is the mortar that holds your day together. To build a million-dollar business, think million-dollar thoughts. That's the only way to motivate yourself to take million-dollar action. Test: Before leaving this blog and heading to ESPN.com, Facebook, or to check your email for the 11th time today, ask yourself: "Would a $1-million person do this?"